Multilingualism (CeLM). Here she discusses her recent visit to Malaysia. 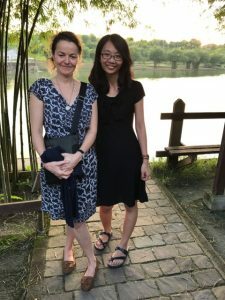 Recently, I travelled to Malaysia on a visit to Dr Tze Peng Wong, of the University of Nottingham, Malaysia (UNM), where we ran a two-day workshop “Language and Literacy Research in a Multilingual Context”. The trip was funded by a British Academy and the Academy of Sciences, Malaysia, Newton Mobility Grant and the workshop was held at the UNM Seminyih campus, near Kuala Lumpur. This workshop involved a series of research talks by leading researchers from universities across the region, including the University of Reading, Malaysia and universities in Kuala Lumpur, Penang and Singapore. It was well-attended by academics, students and practitioners. As well as discussing speakers’ recent research, there was a focus during the workshop on sharing information about newly developed tests of Malay and English language and literacy. These are appropriate for use in the region and essential to the development of research in this field. Tze Peng and I also talked about a collaborative project we are currently carrying out investigating literacy learning in Malaysia’s highly multilingual context, and the extent to which cross-linguistic transfer can help children in their first year of primary school who are learning to read in a second or third language. I also ran a series of research methods training sessions as part of the workshop. It was a very interesting experience and most satisfactory to discuss common themes with peers from different countries and environments. The trip has added an extra dimension to our on-going work at the IoE to explore Language and Literacy.